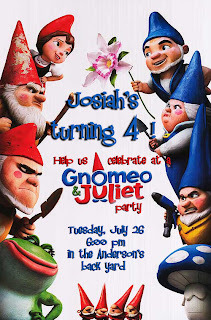 spicy tuesday crafts: Josiah turned 4! So, our little man turned 4! Once I got over the fact that he's been with us for four years already. . . has it REALLY been that long?!?! . . . 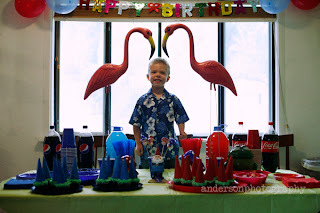 I got to work planning his party. 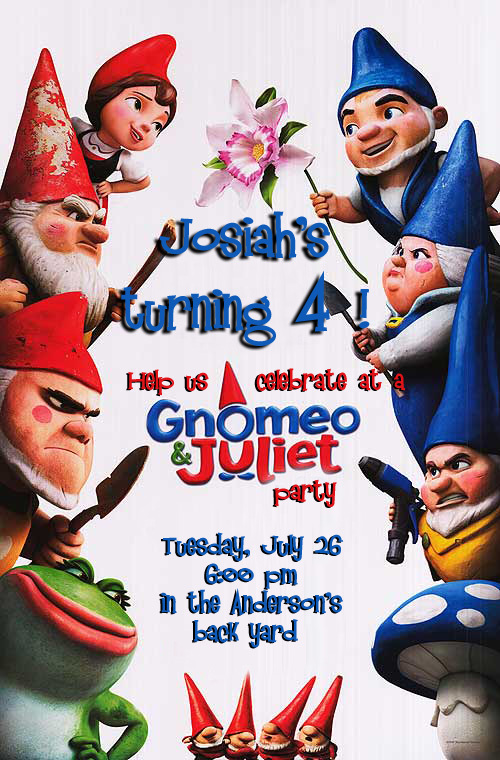 His favorite movie right now is Gnomeo & Juliet so that's what he wanted for his party. But I don't think the movie did very well overall because there was no merchandise to be found -- no figurines, no plush, no decorations, nothing! 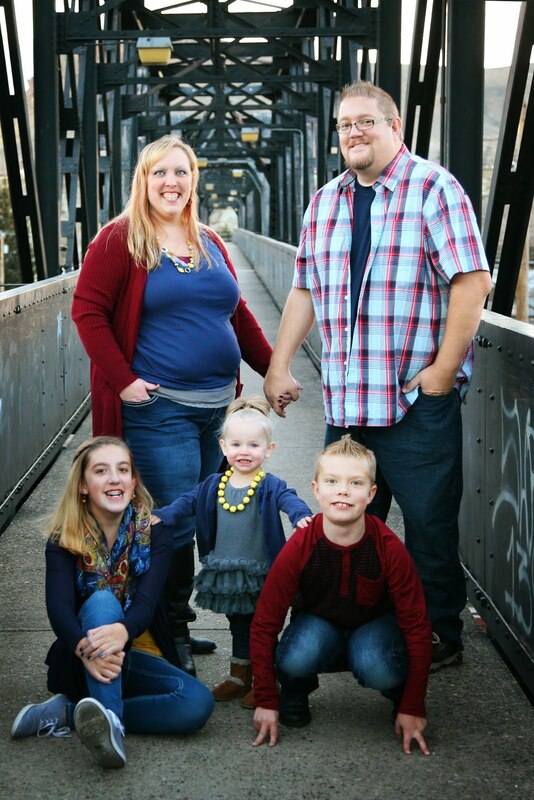 -- so we had to make up our own. For the invites I found an image online of one of the official movie posters and added my own text, then printed them as 4x6 photos. 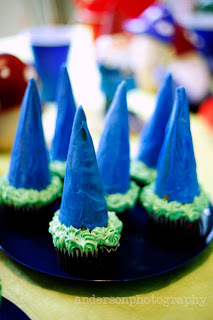 I took sugar cones and coated them with melted Candy Melts, then sunk them into the frosting "grass" on top of chocolate cupcakes. 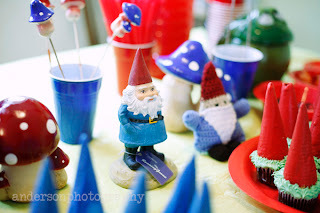 The Travelocity Roaming Gnome made an appearance (found him at Target along with the fantastic mushrooms which I painted) as well as the stuffed crocheted version I made years ago. He (the crocheted one) lives in the center console of my car and has been photographed all over CA, WY, NM, CO, NV, UT, OR and even went with my parents and aunt & uncle to Hawaii two years ago . . . I have a whole scrapbook devoted to his excursions! 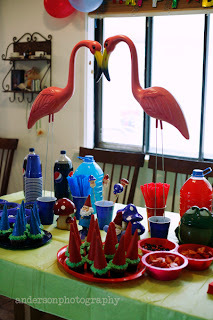 The treats on the Red side were strawberries, dark chocolate Hershey candies (3 shades of red), cupcakes with Strawberry Fields ice cream and Coke and red Hawaiian Punch. 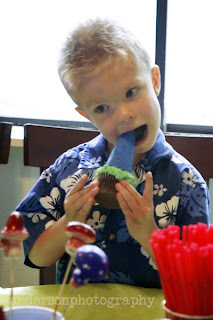 The treats on the Blue side were blueberries, York peppermint candies (blue & white), cupcakes with Birthday Bash ice cream (confetti ice cream with blue frosting ribbons throughout) and Pepsi and blue Hawaiian Punch. 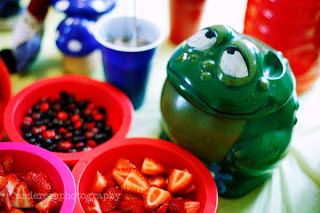 We had our own version of "Nanette the Frog" -- my mom's vintage cookie jar. That thing is older than I am and has been repainted several times but I love it! My dad would happily let it live at my house permanently but Mom wanted it back. He had to eat the frosting first: After the presents . 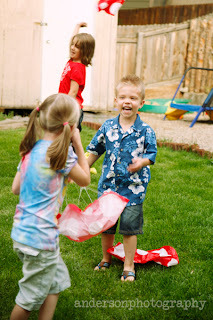 . . the kid made out like a BANDIT, I tell you . 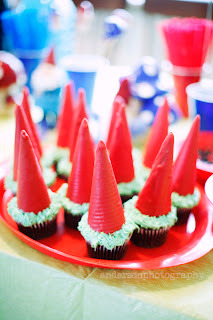 . . and the treats, we all went back outside to launch the Gnome Paratroopers! 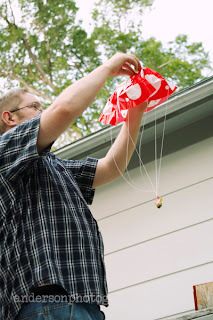 The paratroopers were a huge hit! 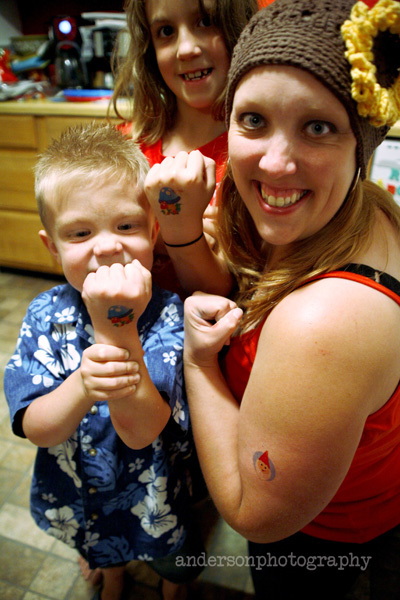 And finally, we ended the night with Gnome tattoos. Those little guys were the HARDEST thing to remove -- they said "temporary" but 5 days and that many showers later I finally had to take the nail polish remover to mine and he still didn't budge. Josiah said he loved his party and had a ton of fun with all his friends and family. I was glad to hear it, because I had a blast! 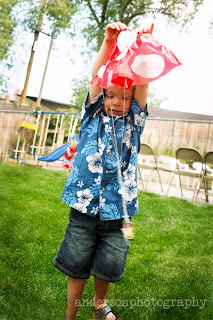 Love that little guy! Back to School Cake Pops!